I usually don’t go out for lunch during the week. We get few a couple days a week, and for the rest of the week, I brown bag it or grab something quick from Wawa. The other day, R wanted to grab some chinese, so I thought I’d go along. 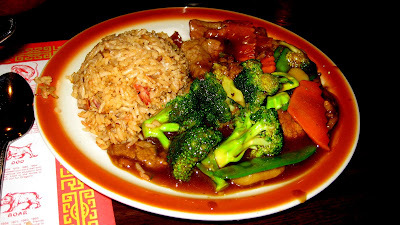 We hopped on over to Golden Dragon in Conshy, which is in Plymouth Square shopping center, where the REI is. It’s one of these non-descript chinese joints with no windows. And on the inside, some booths along the edge with red fabric, some tables, and chinese zodiac placemats. 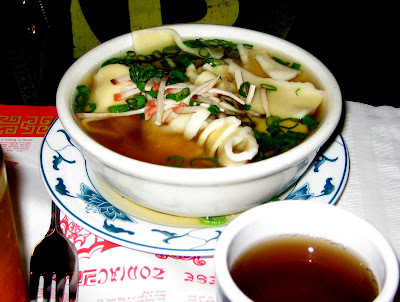 R went simple with wonton soup and an eggroll. Soup? Just fine and dandy. I went with one of the $6 lunch specials – beef with broccoli. Came with soup and eggroll, and fried rice. The eggroll wasn’t too great, it was more weird. Random shredded dried stuff on the inside, couldn’t really tell what it was. But yes, I ate it anyway! The entree was quite fine. A bit salty for me, but otherwise, a perfectly acceptable lunch special offering. The veggies were quite fresh. I even had so much that I got to eat it for dinner… I love leftovers! The service was ok too, it’s a total family run place. The two ladies working the joint that day looked exactly alike, and had the same funny curly short hairdos. Are there better chinese restaurants around? Hell yes! But it’s fine for a quick lunch bite. I have eaten there twice and got food poisoning both times. Won’t go near the place. I’m pretty sure this is the place that Downtown Harvest named one of their albums for.